In the Atlantic basin all smoked salmon comes from the Atlantic salmon, much of it farmed in Norway, the East coast of Canada and Chile. In the Pacific, a variety of salmon species may be used. Smoked salmon is a popular ingredient in canapés, often combined with cream cheese and lemon juice. Slices of smoked salmon are a popular appetiser in Europe, usually served with some kind of bread. In the UK it is typically eaten with brown bread and a squeeze of lemon; in Germany it is eaten on toast or black bread. 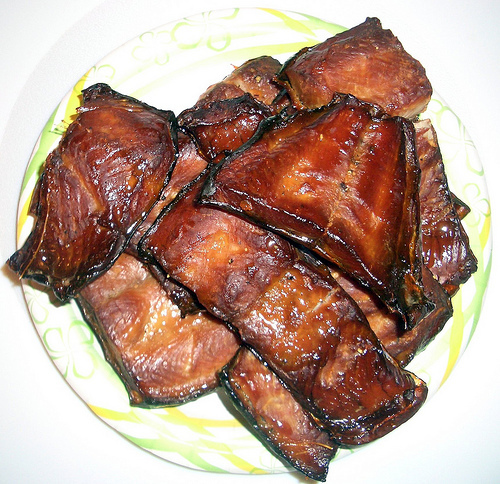 Smoked salmon is sometimes used in sushi, though not widely in Japan, and is more likely to be encountered in North American sushi bars, for example in a "Philadelphia Roll". Most smoked salmon is cold smoked, typically at 37°C (98.6°F). The cold smoking does not cook the fish, resulting in a delicate texture. Although some smokehouses go for a deliberately 'oaky' style with prolonged exposure to smoke from oak chips, industrial production favours less exposure to smoke and a blander style, using cheaper woods. Scottish and Irish smoked salmon is considered a delicacy, even with increased availability since the advent of fish farming from the 1970s. Smoked wild salmon is still available, but in Europe is very rare and very expensive and usually only available from specialist dealers. In North America, Alaskan wild salmon is commonly smoked, and many Alaskans have their own smoker or even a small smokehouse. It is prized for its 'meaty' flavour and 'naturalness' compared to the 'flabby' texture of farmed salmon. Normally used for trout, hot smoking 'cooks' the salmon making it less moist, and firmer, with a less delicate taste. It may be eaten like cold smoked salmon, or mixed with salads or pasta. Before smoking, salmon is often cured in a brining solution which contains salt, sugar or another type of sweetener, and optionally seasonings to add flavor. The proteins in the fish are modified by the salt, which enables the flesh of the salmon to hold moisture better than it would if not brined. The sugar is hydrophilic, and also adds to the moistness of the smoked salmon. Salt and sugar are also preservatives, extending the storage life and freshness of the salmon. Although superficially similar to smoked salmon, and often served alongside it or as an alternative, the Scandinavian dish gravlax (or grave salmon), is not smoked but cured. It can be used to flavor cream cheese and other spreads.